Here in Georgia, we hear a lot about being part of the sunbelt. But, don't let that fool you. Our winters can be brutal. Severe winter weather, particularly ice and freezing rain, can beckon during this time of year. When it does, your security, even in your own home, could come under threat. Without the appropriate preparation, you might face property damage and safety risks. So, what can you do to protect yourself during periods of bad weather. Preparing you home for ice and freezing rain requires attention to personal needs and structural safety. The more care you take, the lower your chances of having to file a homeowners insurance claim. That's a practical approach that might help keep your policy rates in line down the road. Freezing rain, sleet and ice occur when falling rain passes through a region of super cold air before it hits the ground. The rain freezes, and then accumulates on surfaces. Therefore, a layer of ice replaces what would normally be a layer of rainwater, or puddles. Many people think ice is harmless. Think again. Ice is slippery. When it freezes, it makes surfaces unstable and creates potential safety threats. These might include driving risks, fall and other injury risks for those moving around outside. Ice accumulates. Unlike water, ice cannot run off of surfaces and fall onto the ground. Instead, it will freeze onto surfaces like your roof, gutters, power lines, driveway and surrounding vegetation. Therefore, the weight and accumulation might cause property damage. Ice is cold. Rather, cold temperatures must exist for this weather to occur. The cold might create significant property damage risks. For example, it might cause burst pipes, foundation damage and glass fracturing. Furthermore, exposure to cold is dangerous for any human. Therefore, if you don't have proper insulation, you could face safety risks. Ice melts. Depending on the rate of melting and level of saturation, the thawing water might cause additional property damage and safety threats. Furthermore, the risk of refreezes (and thus, new or further property damage) will remain for some time after the actual event. So, whenever ice beckons, it is no wonder that it often causes significant disruptions to daily life. You'll likely see schools close, roads shut down and public services cut back. It's therefore a good idea to prepare for any potential problem when an ice storm threatens. The key to this process is to plan ahead. Don't wait until the moment a storm strikes to get ready. Start now, and you'll have less to worry about when the clouds roll in. There is no other way to say it: Ice is dangerous. You could slip on accumulated ice and sustain serious injuries. Even if you can't clearly see ice, that does not mean it is not there. Even the thinnest layers of ice might create safety risks. Therefore, in case storms beckon, put a security kit in order ahead of time. Make sure you have an appropriate supply of heat. Your HVAC system and any electric space heaters should function appropriately. In case of a power loss, have blankets, battery heaters and candles on hand. If you plan to make a fire in the fireplace, ensure that the chimney is clear. Test your generator if you plan to use it for power losses. Keep your cell phone charged in case you need to call for assistance at any time. Run a supply of fresh water in you bathtub. Or, buy a significant quantity of bottled water. In case of pipeline damage, you might need this water to bathe, drink and clean. Keep a supply of non-perishable food on hand. Also ensure you have any appropriate medication and medical supplies in the house. Buy a quantity of ice melt to spread on pathways you frequent. You should likely spread it on your driveway, front path and near all doorways. Don't venture outside for the duration of the storm, and do not drive. Wait until roads are passable once again. 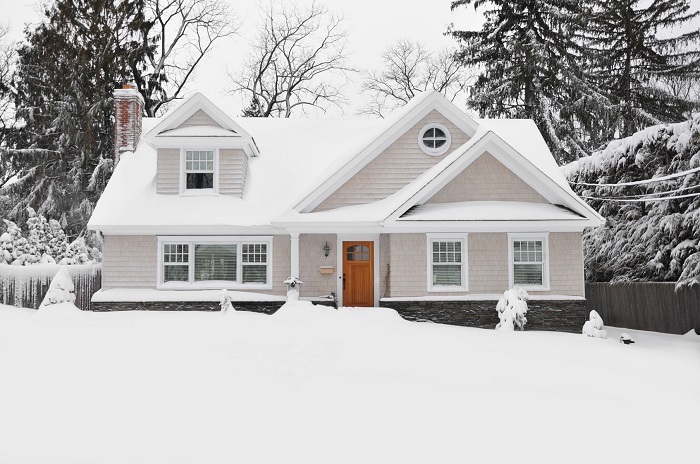 You don't want to experience any types of home damage during ice storms. What can you do to protect your property? Ensure that the seals around doors, windows and foundations can keep water out. Wrap exposed pipes to keep water from freezing inside them. Consider keeping a slow stream of water dripping in the line. These steps help prevent burst pipes. Clear away dead vegetation and that which overhangs your home. You want to minimize the chances of foliage falling onto the property. Clean out the gutters and drainage ditches. At water melts, it will need a clear path to wash away from the home. Still, even with the best-laid plans, you might not be able to avoid ice storm damage. In the even that you could not prevent certain damage, you might be able to file a claim on your homeowners insurance. However, you'll need to talk to your insurer about the cause of your ice damage. Some policies might not include coverage for such losses. Therefore, pull out your policy early this winter. Review it to see if it provides any coverage for ice damage. If you have any questions, contact one of our agents. We are happy to help you understand your coverage.